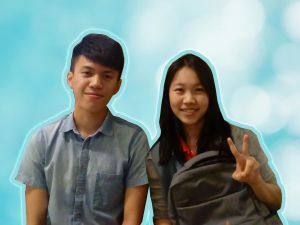 Moving Forward: Brief interview with two interns from TAR UC - Datum ClearMind s.b. Two interns from Tunku Abdul Rahman University College (TAR UC), Waikei and David, had recently completed their internship term at Datum. Both were from TAR UC’s programming course. I, Kit, sat down with them to briefly talk about their experiences in the company. Waikei: My name is Waikei, and i graduated from TAR UC (Tunku Abdul Rahman University College). I am 23 years old. David: My name is David, and I also graduated from TAR UC. I am also 23 years old. K: Since you both pursued programming, what got you interested in it? WK: I like to see ‘output’. Finishing my work makes me happy, since I consider being hardworking as one of my strengths. Programming also needs a lot of thinking, and that’s why I like it. D: I’m not interested in other fields, like accounting or business, for example. I just like programming. K: How did you come across Datum? WK: College provided us with a list of companies. From there, we did our own research and looked around on Jobstreet. K: How has it been like working here? The culture, the people? D: The work is challenging. Everyday we could have a new problem we needed to go through. The people are friendly though, willing to teach us and also taught us things not from the college syllabus! K: The company’s mission is “improve life quality of working people”. What do you think about it? D: I feel it’s like aiming to reduce the workload and lower the amount of labour needed in monotonous tasks. (Make it) be more efficient, on top of keeping that information secure. K: Since you’ve been working on company software for a while, how much do you think you’ve contributed to this mission? K: How do you see applying your experience here in the future/your future job? WK: I feel I’ve gained more knowledge in general, to apply in the future. D: I learned a lot about new technology and trends that I’m sure I can use. K: What advice can you give to new interns? WK: Communication is my biggest weakness, so I would advise them to ask superiors when you’re not sure, and not stay too long on one problem. The office is open so it’s very easy to talk to your coworkers when you need to. K: How about describing your experience at Datum in 10 words or less? K: Any parting thoughts as we wrap up? WK & D: Just do your best! Thus concluded the interview. We wish them all the best in their future endeavours!